The easy way to get started in crowdfund investing Crowdfund investing (CFI) is going to be the next big thing on Wall Street. U.S. investment banks, brokerage houses, and law firms are gearing up for the creation and regulation of new financial products that will be available to the general public starting in early 2013. The introduction of these products will revolutionize the financing of small businesses and startups for these key reasons: * Entrepreneurs and small business owners, who have had difficulty obtaining capital through traditional means (such as bank loans and angel investors) in recent years, will have access to investors around the world through social media. * For the first time, investors (so-called unqualified investors) will be able to purchase an equity stake in a business or new investment vehicle. The Securities and Exchange Commission (SEC) is overseeing the creation of online portals that will allow entrepreneurs and small investors to connect. When these portals go live in 2013, Crowdfund Investing For Dummies will be on the front line to educate business owners, other entrepreneurs, and investors alike. Crowdfund Investing For Dummies will walk entrepreneurs and investors, like yourself, through this new investing experience, beginning with explaining how and why CFI developed and what the 2012 JOBS says about CFI. Entrepreneurs will find out how much funding they can realistically raise through CFI; how to plan and launch a CFI campaign; how to manage the crowd after a campaign is successful; and how to work within the SEC s regulations at every stage. Investors will discover: the benefits and risks of CFI;how much they can invest; how a CFI investment may fit into a broader investment portfolio; how to provide value to the business or project being funded; and how to bow out of an investment when the time is right. 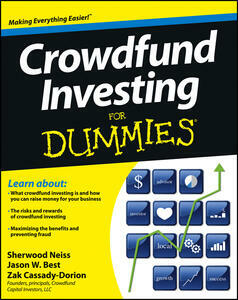 Crowdfund Investing For Dummies is an indispensable resource for long time investors and novice investors alike.